Posted by Ron Neal on Wednesday, October 11th, 2017 at 12:43pm. 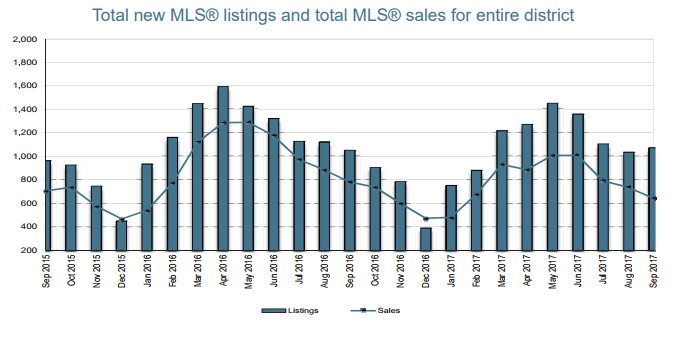 This proportion of listings to sales is overall about 3 to 1, or about a three month supply. Not fully balanced and still very undersupplied in some property types, but much more balanced than the one month supply we had for several months. The record-breaking pace of sales we were experiencing is in our rearview mirror, for now. Is the Victoria Real Estate Market Slowing Down? Buyers are finding more opportunities to offer on listings without competition and upward pressure on prices has generally subsided. There are some indications of prices having retracted some with fewer competing buyers. The Victoria Real Estate Board (VREB) reports Home Price Index Benchmark prices of detached single family homes in Victoria’s core at $823,100 in September 2017, up 11% from $742,200 in September 2016. With foreign buyer taxes, other new taxes being considered, changes contemplated for capital gains, small corporations under the gun, review of rent controls and restrictions (rent increases in BC limited to 4.0% in 2018), tightening of rules around short-term vacation rentals and mortgage rates and rules increasing, we are finding increasingly that both buyers and sellers are paying close attention to government initiatives and their impact. For information relevant to your own property and neighbourhood, please contact us for a personal consultation, with no obligation of course.